Four Clowns’ Codigo Cube Trivia is your basic trivia game, cloud-based, with a physical die. The die’s six sides each feature a different QR code. 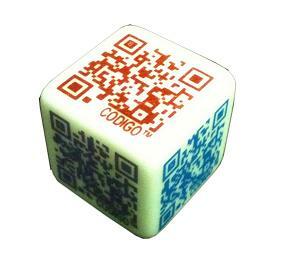 You roll the die and scan it with your phone to determine from which category your question will be chosen. Data is stored on Four Clown’s servers, so new questions can be added without having to purchase additional dice. Different question sets, however, are packaged (virtually) with different dice—$10 each for Kidz, Teen, Entertainment, Sports, and RPG.